The dictionary says a masterpiece is: the most outstanding piece of work of a creative artist. 7. And Jesus did just that – he laid down his life for you. 1. YOU ARE a loved and cherished Child of God! 2. YOU ARE a new creation in Christ; you are no longer the same as you were before you knew Christ. 3. And God is creating a new way just for YOU; He is bringing restoration to your life. ​ Are you feeling like God must have abandoned you because so much has seemingly gone utterly wrong? Does it feel like God made a mistake? Or forgot? Or maybe you wonder if He's surprised by your circumstances and wondering how to redeem and restore things, or if that's even possible. Read Jeremiah 29:11-14 again. The Lord is waiting and listening to hear your cry! Please know that God HAS NOT forgotten you! You have not been abandoned and He is not surprised by your circumstances. God can see the entirety of your life, from your first breath to your last breath, in a single glance of His eye! He knew you before you were even born, and you were precious to Him even then! Oh Praise to the Lord that we can have such restoration and hope in Him! Praise Him for His love and mercy and grace which He so abundantly pours out on us when we call out to Him. Praise Him for the blessings within our lives and praise Him for the trials which He uses to teach us and mold us into His likeness. Yes, we praise Him through the laughter and the tears, in the night and in day we will praise Him. Oh friends, all of these things I write about I know to be true in my own life. Yes, God has rescued me and restored me time and time again! He has turned my mess into His message! Mine and your life paths may be different, but we each have begun in the same place, known by Him before we were in our mother’s womb; and as children of God, we will each end in the same place, praising Him eternally in Heaven. And I praise God for the blessing of this particular season when He designed for our paths, in between the beginning and the end, to intersect for a moment in time. 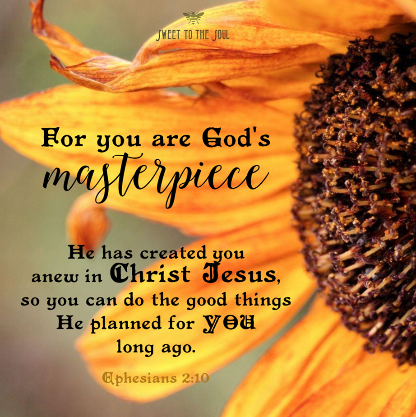 click to tweet >> Find confidence, identity and hope in knowing your are God's Masterpiece. This is such a lovely and encouraging post, Jana. It is hard for us to fathom how much God loves us, especially on days when we mess up and everything seems to be spinning out of control, but I'm so grateful his love surpasses all understanding. It truly is a immeasurable gift! Blessings to you, friend. I am so grateful for his love also! Even as I was writing, it's seems hard for me to believe... at least about me. It's easy to tell others they are so loved by Him, but sometimes hard to see it for ourselves. thank you for your encouragement sweet friend! Thank you Tai! So blessed you dropped by today! thank you Lyli.. and thanks for stopping by! I appreciate your encouragement. This is just lovely - and so full of truth and encouragement! So thankful I stopped by today! We are neighbors over at the RaRaLinkup! Jana, these are beautiful truths to hold on to. They make our faith. They pave the way. The light our path. Thank you for bringing them to light!